Ever wonder when those coals are ready to go? Here are some tips so you can get that temperature right EVERY TIME! HIGH: Coals are RED-HOT and have a THIN layer of white ash on them (usually takes about 20 to 25 minutes). MEDIUM-HIGH: Coals are hardly glowing and have a THICK layer of white ash on them (around 30 minutes). 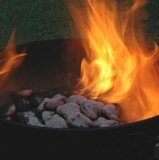 MEDIUM: Coals have a SOLID layer of white ash on them (over 30 minutes). Hope these tips help and GO MEAT!